Church on Sunday will never be the same when you wear one of these banded collar shirts with embroidered crosses. 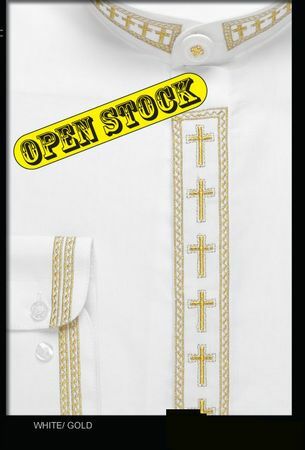 A banded collar shirt with cross embroidery will show everyone in your Church that you are devout. This cross embroidered shirt features embroidery on the cuffs, collar and front placket. Made of easy care Poly/Cotton Blend. Great for Church Groups and Group Orders.